I interviewed Yellow Elm owner Elizabeth Blanton to give you some more information about Yellow Elm straight from the source! What gave you the idea for Yellow Elm and how did you get started? I learned how to felt in a fiber arts class I took as an elective in college and immediately fell in love with the process. After making some large felt wall-hangings for the class, I used some leftover felt to make brooches as gifts for my friends and got a great response, so after college I decided to make more wearable art and see what happened with it. There has been a huge trend recently in crafts and handmade items and I’m so excited to be a part of that. What do you love most about the pieces you make? I love the uniqueness of each piece. I can never make two pieces exactly alike, so everyone who wears Yellow Elm can truly know they have an accessory that no one else has. My favorite is usually what I’m working on at the moment. I’ve just started making small brooches with beads on top in soft spring colors, and those are my favorites right now. 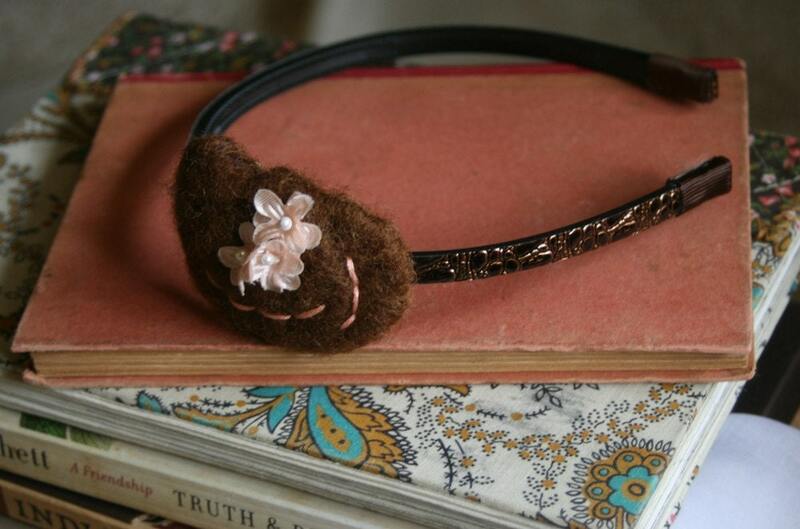 Do you have plans for any other products besides headbands and brooches? Yes definitely! Jewelry, purses, hats, and scarves are all possibilities for future products. 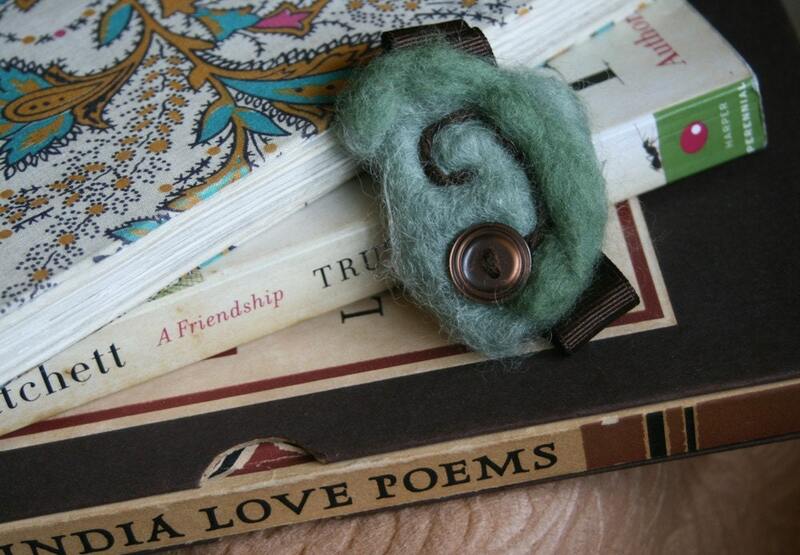 I’m working on a vintage line of headbands and brooches as well that I’m pretty excited about. Do you prefer selling on etsy or selling to stores? I love both for different reasons. It’s always fantastic to find a shop that is the perfect fit for Yellow Elm and I really enjoy working with shop owners to get just the right Yellow Elm pieces in their stores. I am so glad to have an etsy shop as well because I can reach so many people with the internet–people all over the world. Do you have a favorite fellow etsy artist? So many great choices I could never pick just one! I keep my “favorites” page on my etsy shop pretty current and always mark a favorite shop or item. 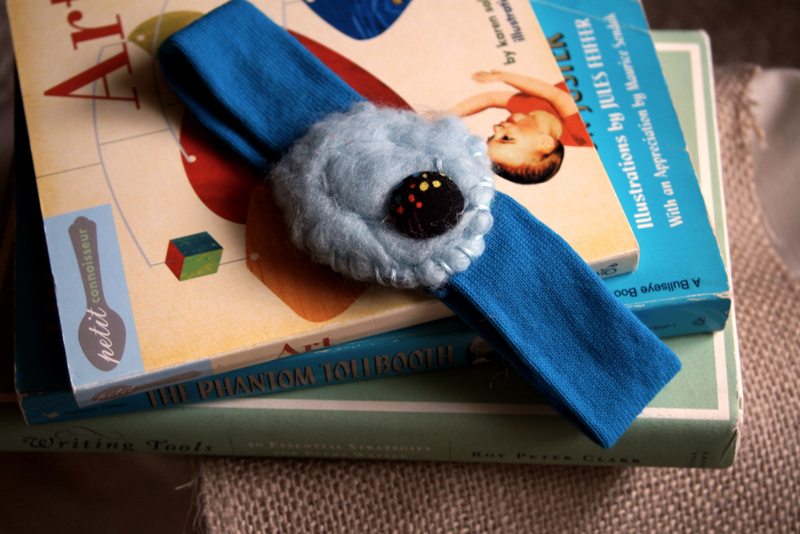 A Little Bit of All of It is giving away this precious baby headband! 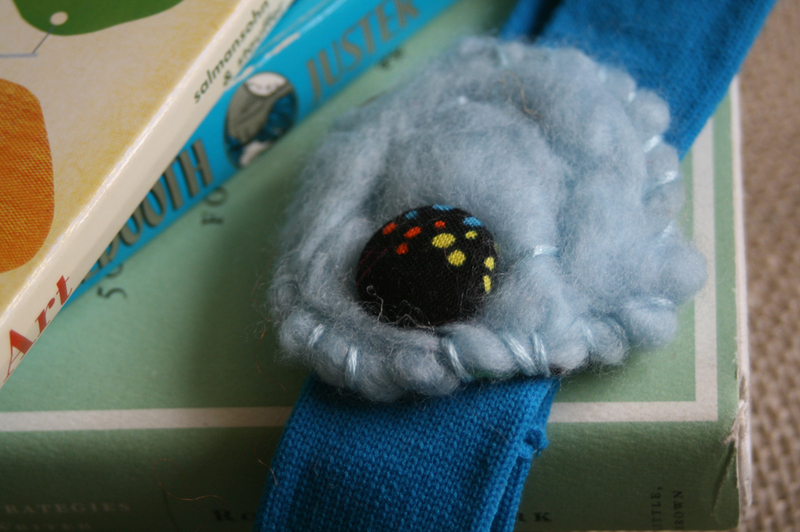 It is a baby headband with a soft blue piece of felt on a bright blue fabric band, with a black & polka dot fabric button and some simple baby blue embroidery. There are 5 ways to enter. You can do 1, a couple or all of them. Obviously the more you do, the better your chances of winning are. I’ll draw a winner randomly using random.org on March 17th! The winner will be contacted via email. “Like” A Little Bit of All of It on Facebook and come back and leave a comment here that you did with your FB name. Go to Yellow Elm’s etsy store and come back and leave a comment with the name of your favorite piece. “Like” Yellow Elm on Facebook and come back and leave a comment here that you did with your FB name. Subscribe to the Yellow Elm blog and leave a comment here that you did. I’m SUPER excited about our second ever giveaway on A Little Bit of All of It in honor of my first full year of blogging! CaughtREDhanded is giving away one of their pieces to one of my readers! 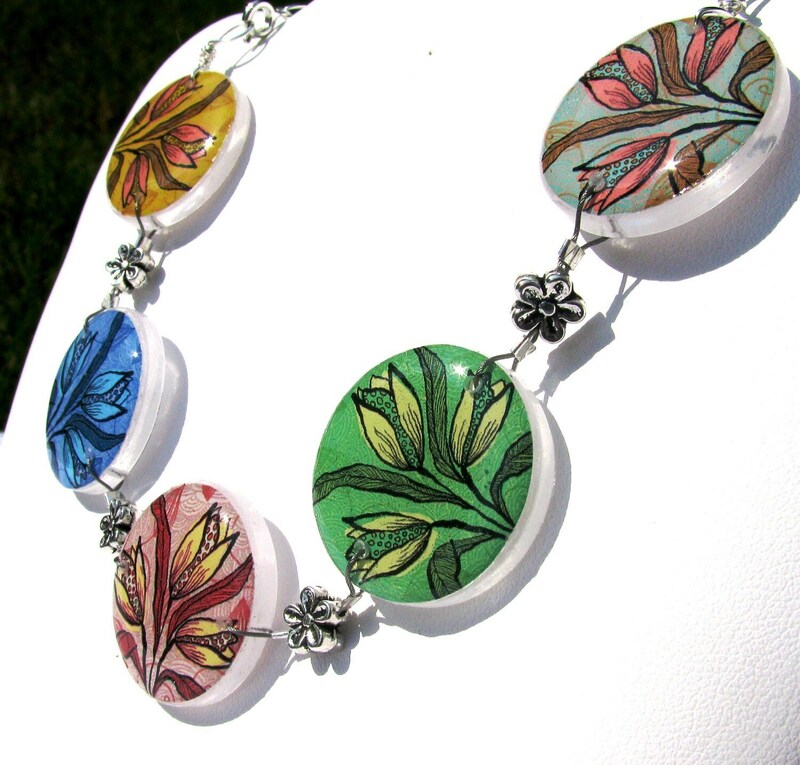 CaughtREDhanded is handmade original art trapped under glass. The brand carries pendants, earrings, bracelets, belt buckles, rings and does custom work as well. I asked owner, Amy Galon, some questions and I’ve shared them below. To enter the giveaway, follow the instructions at the end of the post. What do you love most about the jewelry you make? 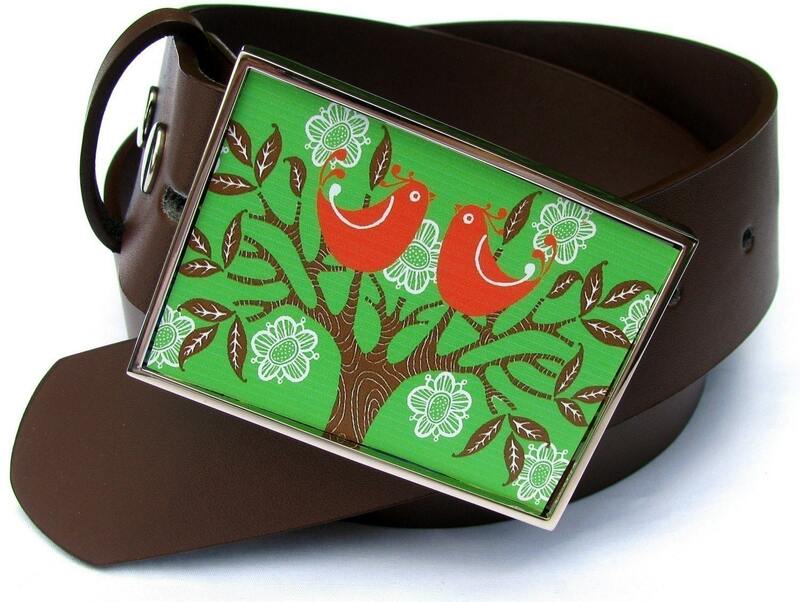 I love that it is original, handmade in the USA by a stay-at-home mom! You can not find another piece of jewelry out there just like ours–it is like a little stamp of myself that I get to put on the world. That is hard. I guess, right now, I am favoring our new Pebble line (I love NEW!). If I had to pick a favorite piece I would have to say Luna Garden. What’s a typical day like for you at CaughtREDhanded? Pack up any orders ready to ship in the morning and start any new orders. Finish making orders, call customers, follow up on leads etc. in the afternoon. I keep on working (making, taking pictures, emailing, packaging, ordering, customer follow-ups, etc.) through late afternoon. After dinner I set all the jewelry made in glass. You recently created an earring line and a bracelet line. Tell us about those. They are my favorite new collections (I told you I like new;)). I wanted to expand our line past just our staple pendant line. What do you love about selling on Etsy? The exposure. Etsy is where it all started and without it, I would not have been able to stay at home with my son, Sebastian, and pursue a passion that I love. I am truly blessed and Etsy was a major catalyst in this dream of mine. Do you have a fellow Etsy artist that you buy from over and over again? Oh yes! I have some favorites for sure! 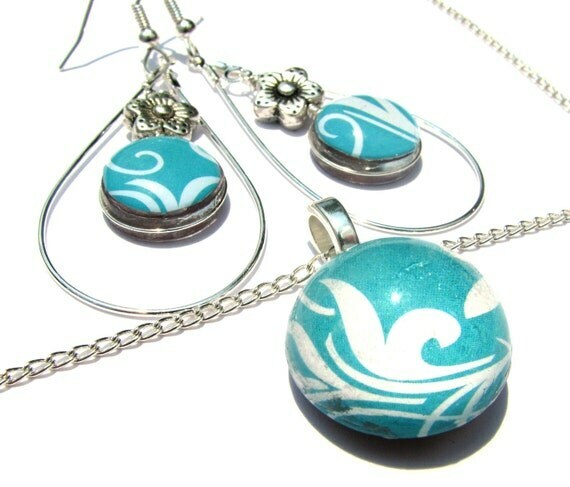 Cori Dantini–she did some design work for us and I order Christmas ornaments and customer work from her ALL the time. She is fantastic! I often buy cards from another favorite artist Irene Suchocki. Her photography is amazing. My husband, Jim, orders from Man Cave consistently as well. I bought him a shave set from their shop last year and he loved it so much he consistently buys refills. These are just a few of my favorites that I order from but there are sooooo many more I could mention! There are 5 ways to enter. You can do 1, a couple or all of them. Obviously the more you do, the better your chances of winning are. I’ll draw a winner randomly using random.org on December 1st! Post a comment and let me know your favorite post here on the blog and why. Go to CaughtREDhanded’s Etsy store and come back and leave a comment with the name of your favorite piece. Post a picture on CaughtREDhanded’s Facebook page wearing a CRH piece and come back and leave a comment here that you did with your FB name. Become a fan of CaughtREDhanded on Facebook and leave a comment here that you did with your FB name. I wanted a way to share some of the great stuff I’ve read through the week and support my fellow bloggers. 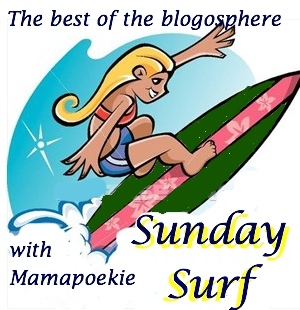 Then I saw that Mamapoekie at Authentic Parenting was already doing that so I’m joining her to bring you Sunday Surf! Enjoy! Parenting Podcasts and a Giveaway! I love listening to podcasts about parenting and other baby stuff! You can even see on the righthand side, I list some of my favorites. I was recently asked to review a new podcast here on my blog so I thought it would be a great opportunity to review a couple others as well. I’ll start with a free podcast I discovered when I was pregnant called Pregtastic. It is such a fun and informative podcast to listen to while pregnant and commiserate with other soon-to-be mom’s. The show always starts with the podcasters (other pregnant mom’s) giving to 2 ups and 2 downs of their pregnancy. Then they discuss various pregnancy/baby/parenting topics either with an expert guest or amongst themselves. I really enjoyed listening while pregnant and learning about all sorts of topics along with the other podcasters. They also usually have the podcasters come back and give their birth story which I loved, too. Some of the topics they have covered include breastfeeding (as well as having a sister show hosted by a lactation consultant, Mommy’s Milk and More), Epidurals, Hypnobirthing, Maternity Clothes, and Baby Bargains, just to name a few. As far as their website, I like that if you hear about something on the show (like a book, CD or website) that you want to check out later, they include show notes as well as have a store that sells anything mentioned on the show. I don’t have to try to scribble down a website while driving down the road. :) Also, they have forums so you can talk with the other podcasters and other listeners. The podcast is free but if you want to contribute, you can donate on the site. There is one free podcast, Sleep: Birth to 2 months, and this was the first one I listened to. I found Dr. Satterwhite easy to listen to and friendly. I felt like I was sitting in his office with him. He presents the different sides of the sleep debate and then gives his own advice from his experiences as a pediatrician. I felt it was fair and didn’t feel offended even though his conclusions are different from the ones I personally hold. I will say I didn’t like that he had some faulty information about co-sleeping. (Co-sleeping done safely actually has a lower SIDS risk than crib sleeping because the baby spends less time in deep sleep and thus arouses more easily and also is next to mom who can hear if her baby’s breathing patterns change or cease altogether and can take action.) He also presents the history behind the back-to-sleep campaign and I enjoyed that as I had not heard that before. The second podcast I listened to was provided to me by Peds in a Podcast, Sleep: 6-12 months. Unfortunately, I didn’t find a lot I personally agreed with for me in this one but I’m sure it would be beneficial to moms who take a different approach to sleep than I do. It’s definitely worth checking out and I even have a 25% off coupon code for my readers to do just that! Just type in “wifemom&more” when you go to order a podcast. The last podcast I am going to review is a free podcast called Babies and Moms: Birth and Beyond. Listening to this podcast is like hanging out with your girlfriends that are moms. It is a group of other mom’s in various stages of parenthood and they have a range of topics they cover. Sometimes they will have an expert guest and sometimes they will just discuss amongst themselves. They discuss babies as well as older kids and other family matters. I have learned a lot from these other moms and their guests and always enjoy hearing their different perspectives. They all seem to respect each other even though they might parent differently which I really like. The website has a tips and tricks section with product recommendations and links to their latest shows. They have a broad range of topics including Children’s Toys, Bonding with Dad, Babywearing, and Organizing Your Pantry. What are some of your favorite podcasts? Leave me a comment and let me know so I can check them out! Also, don’t forget to leave a comment if you would like a FREE podcast from Peds in a Podcast! I have 5 to giveaway. (ETA: I have 3 more to give away! Just comment and I’ll send you a code!) You can also get 25% off as a reader of my blog if you enter “wifemom&more” at checkout.